A typical sight - sheets of music all over the floor. Younger Daughter's fiddle teacher was given a miniature violin as a Christmas present (shown next to a set of keys and on my hand). It was so astoundingly perfect that I tried playing it. No such luck. And updated view of my canning closet. The dogs on a frosty morning. Snap is learning to crow. He sounds pretty funny at this point - like he's gargling - but he's trying. It's driving our other rooster nuts, though. Oh no! Competition! 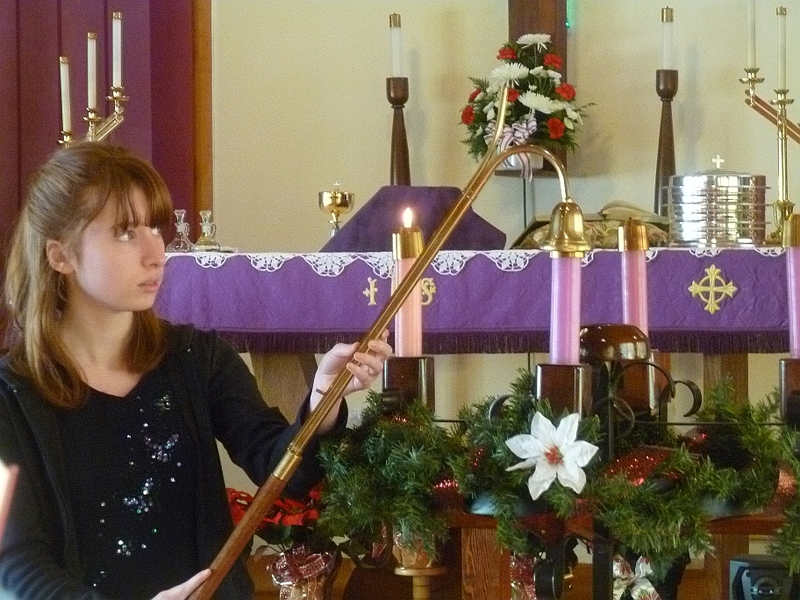 Older Daughter extinguishing the candles at church yesterday morning. Passing the lake yesterday morning, we noticed fissures in the ice. It's been cold enough after last week's thaw that ice is once again forming. With a light dusting of snow, it makes for interesting patterns. Advent wreath with a hurricane lantern in the middle (well, why not?). 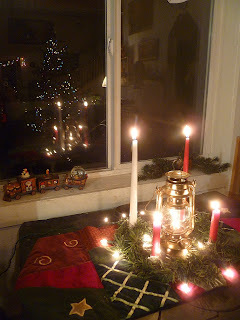 You can see the Christmas tree reflected in the window. Dawn and the morning star. It was momentarily clear before clouding over. Unfortunately it's cloudy tonight so we won't be able to see the lunar eclipse. Breakfast for Matilda and Gimli. Is it just us, or does Venus (the morning star) seem brighter than usual lately? It's glaring like a brilliant beacon in the eastern sky! Early one morning about an hour before sunrise a couple of years ago, we watched the moon pass in front of Venus. That was a first for us and quite thrilling. We love your pix, Patrice! The photo of " A chicken contemplates life" struck me as very funny. Thanks for the laugh. The tiny violet is so adorable. Was it a salesman's sample? Well, after all these months, I still have pantry envy. Your canning pantry is fuller and is so very neat and tidy. NICE!! Forgot to mention that I, too, am disappointed to be unable to see the total lunar eclipse. It's been overcast, raining, hailing, snowing, thundering for a week here (or so it seems) and the prospects of seeing the eclipse are zero. Darn it! Thankfully, I saw a total lunar eclipse a couple of years ago and it was interesting, but not terribly exciting. It appeared as though the moon was deep orange in color, not unlike when a large wildfire colors the air with smoke on a warm summer night.